God is accelerating his revelation in the area of prophecy and hearing his voice! At the school you will have opportunity to step out in new levels of personal prophecy and also come into a greater accuracy in hearing God's voice. If you are starting out this will be a great school for you but also for those who wish to advance in their gifting. There will be teaching and fun and creative activations that will raise your faith and expectations in stepping out in the Prophetic. Pay $80 deposit before the start of the School and pay the $70 balance on or before Week 5 (Wednesday 21/8/19). Pay $20 per night as a casual attendee either online or on the night before 7pm. You are invited to our Bundaberg Prophetic Empowerment Workshop! It commences on Friday 5th April @ 6:30pm - 9:00pm and Saturday 6th April @ 9:00am - 4:00pm. There will be teaching on hearing God's voice, moving in the Prophetic, activations, word of knowledge and much more. This will be suitable if you are new to the Prophetic and those who have been exercising their Prophetic gift. We look forward to seeing you in Bundaberg in April! Pay $80 deposit before the start of the School and pay the $70 balance on or before Week 4, Wednesday 6/3/2019). Both up-front payments ($150) and instalment payments (of $80 up-front and $70 balance) can be paid online through link below or at the School on the night between 6:45 and 7pm. 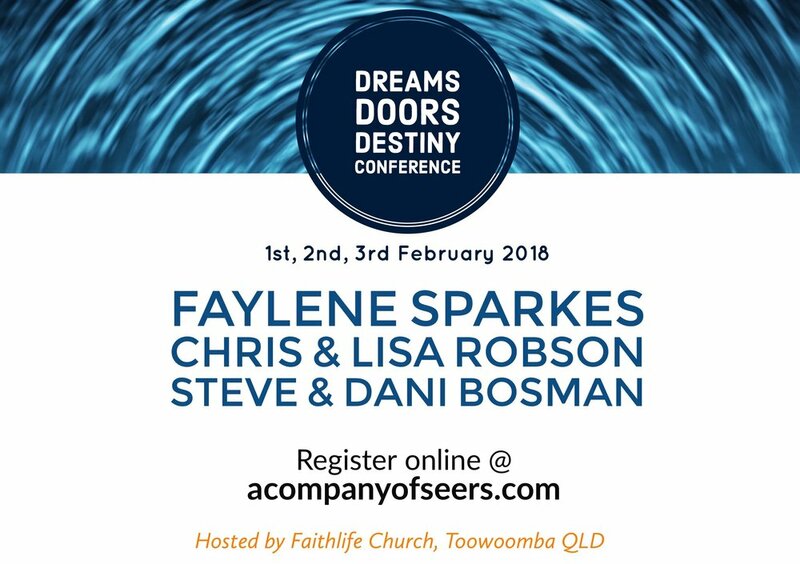 Faylene has a strong prophetic anointing on her life that has had a tremendous impact on 100’s across Australia. Faylene has for the last 25 years traveled extensively as an Itinerant Minister at churches and conferences. Faylene teaches passionately both the Word and the practical. Her ministry is also characterised as vibrant and humorous. A prophetic minister known for her down to earth ability to relate God’s Word to real issues. Directions: https://goo.gl/maps/Um5fF4vDcQU2 or call 0400050106 for directions. Pay $80 deposit before the start of the School and pay the $70 balance on or before Week 4 (Tuesday 11/10/2018). Both up-front payments ($150) and installment payments (of $80 up-front and $70 balance) can be paid online through link below or at the School on the night between 6:45 and 7pm. Pay $80 deposit before the start of the School and pay the $70 balance on or before Week 4 (Wednesday 15/8/2018).